For awhile now, I kept seeing this recipe pop up on food blogs. I would bookmark it, then forget about it. And frankly, I will admit, that there’s a local grocery store that sells The. Most. Amazing. Coffeecakes. Ever. 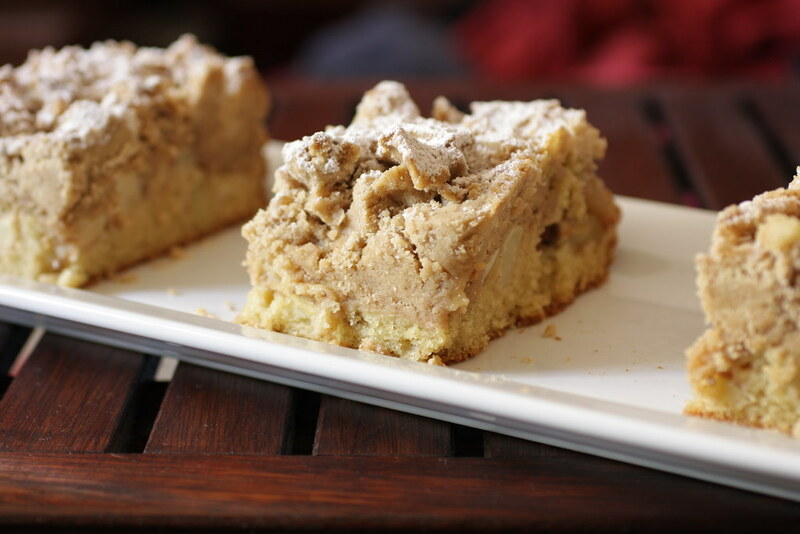 For a long time (well, the couple of months since my friend B discovered this coffeecake), I thought I didn’t want to try to even come close to this coffeecake. 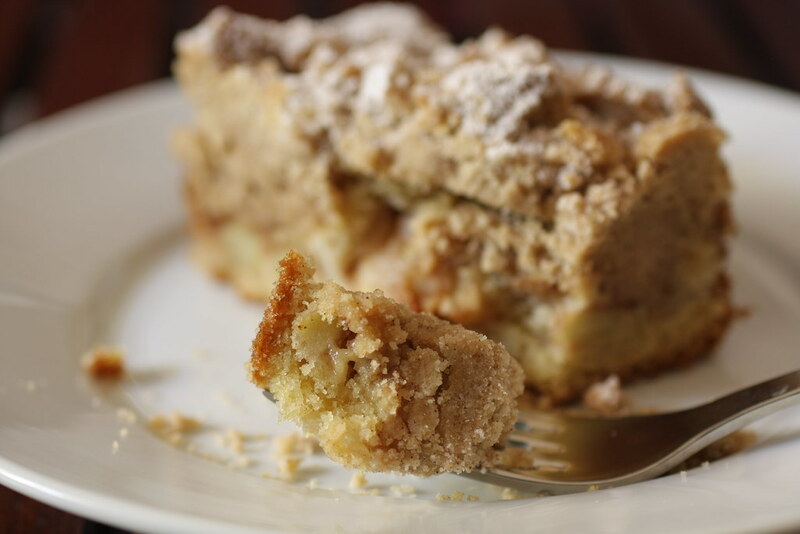 The cake was moist, the apples perfectly spices, the crumbs…my God, the crumbs. Soft, not crisp. Amazing. Decadent. Delicious. Perfect for Sunday mornings. Then I would remember the Big Crumb Coffeecake recipe that everyone has raved about. So, I tried it. I substituted tart baking apples for the rhubarb and used all purpose flour (which many seemed to have done so far without incident), and made the coffeecake. While I wish I could say that it put the other coffeecake to shame, unfortunately, that was not the case. The Big Crumb Coffeecake was good, but I had high expectations, and this cake didn’t quite meet them. 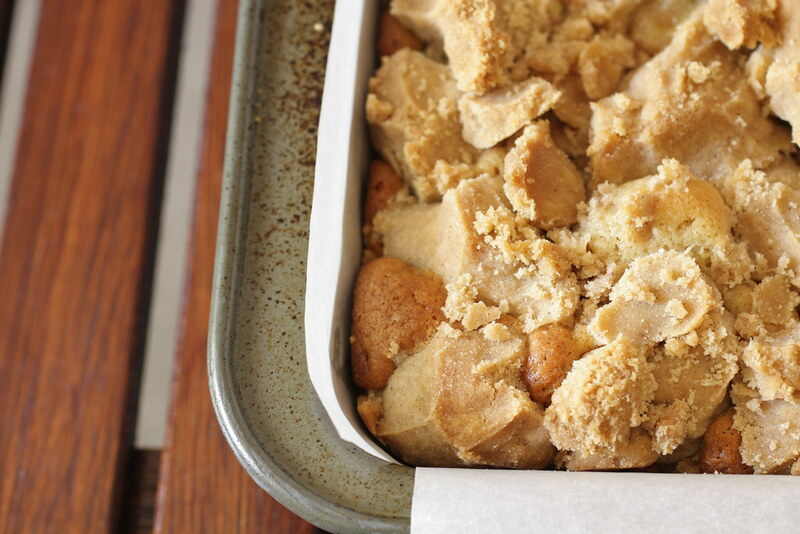 On the other hand, I do have a lot of notes about what I would do differently with this recipe next time: I would use cake flour, I would use McIntosh apples, and I would use less flour in the crumb layer, along with just brown sugar (2/3 cup). Also, I wouldn’t melt the butter in the crumb layer, I would dice the cold butter and mix it into the crumb with my fingers (like I do with my crumble apple pie and my blueberry muffins). Preheat oven to 325*F. Spray an 8×8 inch baking pan with cooking spray and line with parchment, first with a sheet covering one side of the pan, then with a sheet covering the other side of the pan, with about an inch or two of overhang on all sides. Set aside. 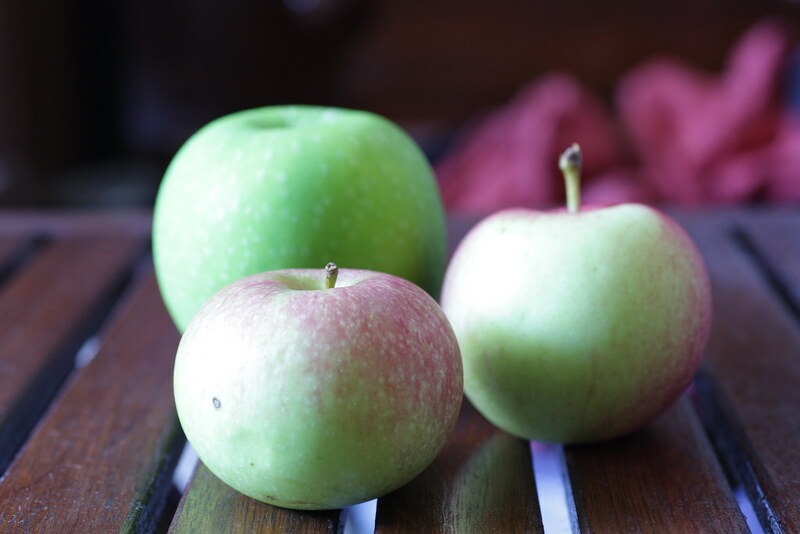 For the filling: Cut apples into small chunks. 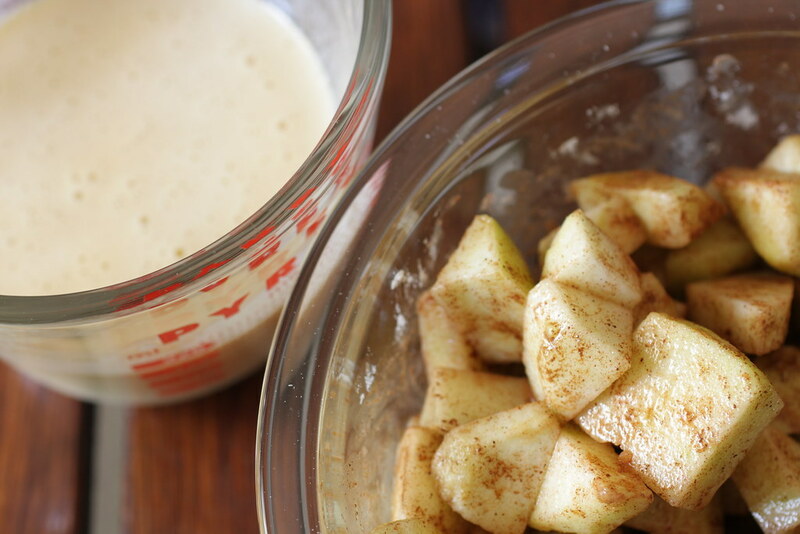 In a small bowl, combine the apples with sugar, cornstarch, and cinnamon; stir to mix. Set aside. Make the crumbs: In a large bowl, whisk the sugars and butter until smooth (the sugar should have dissolved). Whisk in the cinnamon and salt. Stir the flour in with a spatula (it should resemble a solid dough). For the cake: in a liquid measuring cup, whisk together the sour cream, egg, egg yolk, and vanilla. Using a stand mixer fitted with the paddle attachment, mix the flour, sugar, baking soda, baking powder, and salt. Add butter and a generous spoonful of the sour cream mixture, mix on medium-low until flour is moistened. Add remaining sour cream in two additions, beating well after each, scraping down the bowl as necessary. Reserve ½ cup of the batter. Transfer bulk of the batter to the pan and sprinkle with apples. 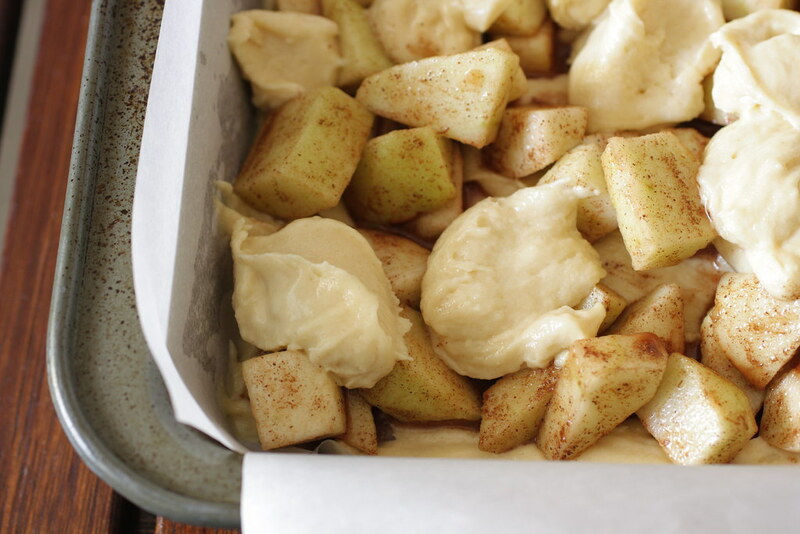 With a spoon, add dollops of the remaining batter over the apples. Break the crumbs into ½ to ¾ inch pieces and sprinkle over the cake. Bake 45-55 minutes, or until inserted toothpick comes out clean. Cool completely. Sift confectioners’ sugar and cinnamon over the top. This recipe was very easy and it was a huge hit at a breakfast party I brought it to. I did not change a thing to the recipe and it was great! I will definitely make it again.